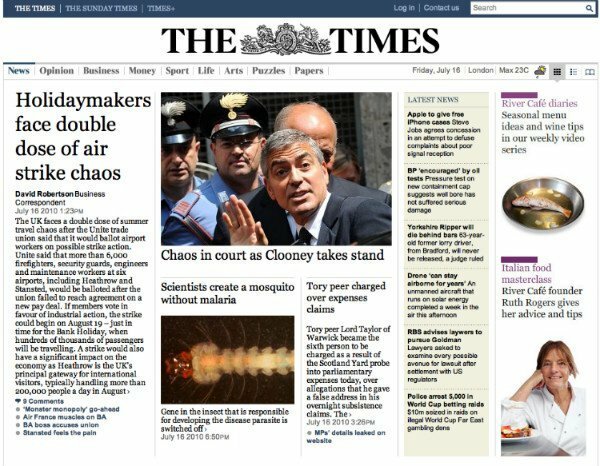 In a follow up to July 12th’s post Media’s two tribes – charging for content The Atlantic’s James Fallows reports The Times of London has placed their bet you will love their headlines so much you will pay for the opportunity to read the article. Click on any link within The Times and you are immediately sent to a pay option. Mr. Fallows references his own Google and the News piece, I recommend the read. Seems this media industry experiment has only just begun, good luck to those companies, The Times, that think this will work. Are you willing to pay for news, sight unseen? Do you think The Times of London offers such a highly-unique perspective on news that is worth paying for? Look at the Economist’s take on the strange survival of ink, on how newspapers have escaped cataclysm by becoming leaner and more focused. Now that sounds like a good plan for most industries.